I’ve become a big fan of blogs. Anyone who visits here will know how often I blog, how I do it and what I talk about. I also enjoy reading other peoples blogs and when possible I like share my comments on what the author has made me think about. Summer was quiet on the blogging front. It felt that plenty of others were similarly distracted with other things or just waiting until everyone was back at work. Yet I found myself often thinking about what was happening around me and could I blog about it. What would I say? How would I frame it? The unanswered questions I was struggling with. The things I didn’t fully understand yet. What I kept coming back to was my attraction to and support of blogging versus the emotional rollercoaster it was subjecting me to. What was going on? Did I have the wrong attitude? Was the issue mine alone? It’s a thorny issue but one that I want to explore here. I’ve deliberately not trawled the web looking for research or opinion on why people blog. It’s not that I’m not interested – it’s just not a question that I want answered by supposed “gurus”. The question behind the question is actually why do I blog? What are my expectations? What am I hoping to achieve? You want to market yourself or your thought leadership and support your business efforts or standing as an expert. You may be a consultant or a charity. The end result you want to achieve is a mixture between engagement and promotion. You have a lot to say and a lot to give. Your thinking and writing is useful to others, valued even. The end result is the giving of knowledge or opinion, not what you get back from it in terms of business or maybe even response. You want to share what you are thinking & experiencing with a view to learning more. The process of writing the blog itself might be the exploration & the learning. Sometimes the learning might come from the feedback you receive. You might be an employee in an organisation, unemployed or even running a business – it doesn’t matter. I’ve come to the view that people never blog just because they like writing. If it was the joy of writing alone they would do it in a manner that was less conspicuous… wouldn’t they? I also think that if your blog is for Commercial or Altruistic reasons then there is certainly a degree of ego at play (when is this not the case!). You want to know that what you are writing about is valued. Whereas if your blog is for Exploration then perhaps ego is less relevant. Where I’m coming to with this is an uneasy sense that perhaps my blog is unwittingly a mixture of all three and that this is the cause of the emotional rollercoaster. I’m still not sure. What I do know is that I need to resolve or possibly come to terms with the fact that I find blogging simultaneously therapeutic & frustrating as well as rewarding & disappointing. What are your thoughts? Is there a better way of looking at this? How does blogging make you feel? Why do you blog? What are your expectations? What are you hoping to achieve? The tree seems to be a Kapok Tree. The photo was taken from a hammock on holiday as I was pondering this subject. 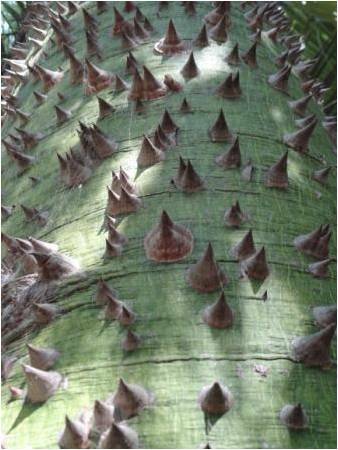 It seemed curious that the thorns were clearly to keep away those who would do harm but allow access to those who wouldn’t cause damage. Humans had already chipped away the defences lower down leaving the tree scarred but supposedly more approachable. I think there’s a parallel here with blogging. Personally, I’d rather be an ant working in a system climbing to the top than be seen as a threat to be repelled or causing irreparable damage.